Dutchman Casparus Van Houten patented hydraulic cocoa press in 1828. Cocoa for drinking contained over 50% fat, and it was difficult to digest. Van Houten could to separate cocoa butter from cocoa liquor with his press and produce low-fat cocoa powder. Thanks to this invention it was possible to make chocolate bars we know today. Van Houten is not independent company for long time but the brand (owned by manufacturer of industrial chocolate Barry Callebaut) is still used, especially for cocoa powder. First chocolate bars were probably produced by english company Fry´s from Bristol in 1847. Milk chocolate Five Boys (introduced in 1902) used to most famous milk chocolate brands but it was discontinued in 1970´s. Swiss Daniel Peter married daughter of F. L. Cailler (founder of the first swiss chocolate factory) in 1863. Inspired by his friend Henri Nestlé whose factory produced milky flour for childern, Peter tried to mix cocoa mass and milk. After many unsuccessful attempts Peter invented milk chocolate in 1875 and called his product Gala Peter. Chocolate brand Gala Peter was produced in Nestlé factories worldwide, but it was discontinued in 1980´s. Swiss Rodolphe Lindt invented the conching process in 1879. Thus one could produce fine chocolate, which melts on the tongue. Chocolate factory Séchaud Fils from Montreaux in Switzerland produced first filled chocolate called Cremor in 1913. Séchaud Fils produced chocolates until 1960´s. 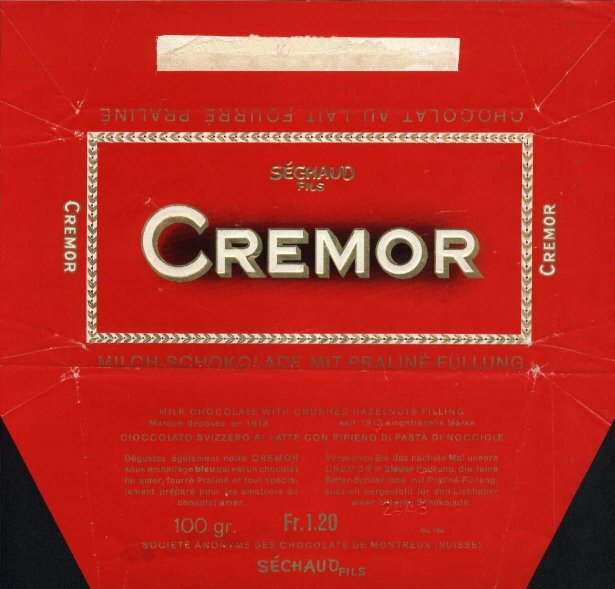 Later chocolate Cremor was made by Chocolat Tobler and than discontinued. First white chocolate was manufactured by swiss company Nestlé in 1930´s. It was called Galak. Cocoa mass, cocoa butter, sugar, (lecithin, vanillin or vanilla). Other vegatable fats than cocoa butter are sometimes used by the cheapest chocolate brands. Good chocolate should contain at least 50% of cocoa solids (cocoa mass + cocoa butter). If it is less it is wrong and too sweet. Cocoa content varies between 35 - 99%. In the last twenty years chocolate with high cocoa content of 70% or more become very popular. French and Russians are lovers of dark chocolate. Cocoa mass, cocoa butter, sugar, dried or condensed milk, (lecithin, vanillin or vanilla). Other vegatable fats than cocoa butter are sometimes used by the cheapest chocolate brands. Cocoa content varies between 18 - 70 %. Good chocolate should contain at least 30% cocoa solids, usualy between 14 -25% milk solids. Mass-produced milk chocolate contains usually only 25% cocoa solids, in case of some English companies even only 20%. Most popular in english speaking countries (famous brands as Hershey milk chocolate and Cadbury Dairy milk) also in many european countries. Some companies manufacture milk chocolate with high cocoa content (and a lower proportion of sugar), in extreme cases up to 70% cocoa. Austrian confectioner Georg Hochleitner developed the first sheep's milk chocolate Choco-Lina in 2002. Chocolate with goat milk Choco-Lisa is also produced now. Chocolate with mare (Zotter) and camel (Al Nassma) milk are also produced now! Cocoa butter, sugar, dried or condensed milk, (lecithin, vanillin or vanilla ). Cocoa solids varies between 18 -33% most often. White chocolate contains only cocoa butter and usually much more milk solids than milk chocolate. White chocolate doesn´t contain cocoa mass and in some countries it cannot be called chocolate but white confectionery. Blond chocolate was introduced by french chocolate maker Valrhona in 2012. In fact blond chocolate is caramelized white chocolate. Company Barry Callebaut introduced pink coloured ruby chocolate in 2017. Cocoa powder, vegetable fat, sugar, milk, (lecithin, vanillin). This product does not too much to do with chocolate. There is no cocoa butter and usually very little of cocoa (1 to 15%) and doesn´t taste nice. Compound chocolate is common in third world countries and in developing countries with low chocolate consumption however some compound chocolates are produced also in western countries (England, dutch bar Koetjesreep now made in Belgium). Dark, milk or white chocolate flavoured by coffee, mint, orange, banana, caramel, strawberry or rum aroma. Dark, milk or white chocolate with air bubbles. First aerated chocolate bars were produced in 1930´s. English company Rowntree introduced aerated milk chocolate Aero in 1935. Chocolate factory Küfferle from Rohatec produced first aerated chocolate bar called Vista in Czechoslovakia also in 1935. It doesn´t contain sugar but other sweeteners like aspartam, maltitol or fructose. They are determinated primarily for people who can not eat sugar, especially diabetics. Artificial sweeteners affect the taste of chocolate quite dramatically, and in most cases increased consumption of sugarfree chocolate has laxative effect. Chocolate made by raw products which are grown according to the rules of organic agriculture. Only less than one percent (about 30,000 tons per year) of the world's cocoa crop comes from the organic farming. Fair trade chocolates are made from cocoa beans which are bought for a fair price from farmers. Chocolate which contains also nuts, raisins, cereals, jelly pieces, dried fruits etc. Amédée Kohler was the first who added hazelnuts to chocolate. Hazelnut and almond chocolates belong to the bestsellers. Chocolates with crushed nuts are popular as well as chocolates with whole kernels. Chocolate lovers in Usa or Poland like chocolates with peanuts, cashew nuts are common in Brazil, chocolates with pistachios are turkish favorites and I love chocolate with macadamias. Fantasy of chocolate producers is neverending, there are hundreds sorts of fillings used for chocolate bars . The most popular are chocolates with nougat and nut fillings. Very frequented are chocolate bars with milk, cocoa, yoghurt, fruit or caramel fillings either liquid or solid. Chocolates with fondant (made of sugar and syrup) fillings (usually with fruit flavour) were quite popular in the past but it is hard to find them now. Germans favorite is chocolate filled with marzipan,in the English-speaking countries there are very common chocolates with caramel or peppermint filling. Chocolates filled with liquid alcohol were developed in Switzerland in the 1930´s, initially with filling in the sugar crust, in 1950´s alcohol filling without sugar crust was developed. Austrian company Zotter is a pioneer of filled chocolate bars with strange fillings, Zotter product range includes about seventy sorts of filled chocolates, which are continuously changed. Company Coppeneur succeeded with a similar concept in Germany. There are different food standards in almost every country. Since 1999 there are new united standards for chocolate in EU. Chocolate in EU may contain up to 5% of vegetable fats. Chocolate producers must state on label the percentage of cocoa solids in chocolate. Milk chocolate must contain at least 25% cocoa solids. However some products as Cadbury Dairy milk doesn´t match with this rule so they must be called family chocolate. Dark chocolate must contain at least 35% cocoa solids. In Switzerland dark chocolate must contain at least 35% of cocoa solids and milk chocolate at least 25% cocoa solids and at least 14% of milk solids. In United States milk chocolate must contain at least 10% of cocoa mass (in USA cocoa mass is called chocolate liquor) and 12% of milk solids. Chocolate must not contain other vegetable fats that cocoa butter. Chocolates with high content of cocoa became popular in 1990´s in Europe. Dark chocolates contained 40 - 60% of cocoa solids in past. German Stollwerck (chocolate Schwarze Herren) and few other german producers sold chocolates with 60% cocoa solids. French chocolate manufacturer Bonnat was the first who started to make chocolates from single origin cocoa beans. Renaissance of high quality dark chocolate bars started in mid 1980´s in France where company Valrhona introduced grand cru dark chocolate Guanaja in 1986. French Lindt increased cocoa share in its chocolate Excellence to 70% in 1989. Since mid 90´s Excellence chocolate bar is sold as thin flat tablet a became bestseller in Europe. Michel Cluizel was the first to sell dark chocolate bars with 99% cocoa. 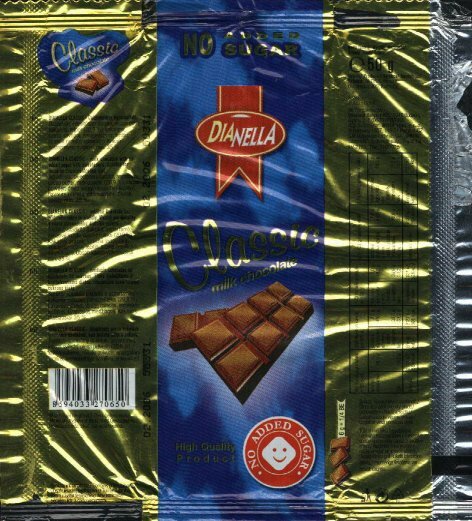 Top-quality bitter chocolate bars are manily produced by French chocolate makers - Valrhona, Chocolat Bonnat, Michel Cluizel, Pralus, also italian chocolate makers as Domori or Amedei have excellent reputation. First bean to bar chocolate was made in Czech republic by Jordi´s chocolate in 2012. There are now at least sixteen bean to bar craft chocolate makers in Czech republic - Jordi´s chocolate, František Bačík - Čokoládovna Troubelice, Ajala, Chocolaterie Willy & Pauli, Amali Manufaktura, Čokoládovna Lana, Chocolate Hill, Xocolatl, Žiži ,Herufek, Míšina čokoláda, Aztec man, Pražská čokoláda, Merrow. Ciao Cacao and Líla chocolate.